Jimmie Durham, Martin Kersels, Michael Landy, Liz Larner, Christian Marclay, Ariel Orozco, Arcangelo Sassolino, Roman Signer, and Johannes Vogl. Part two is more oriented toward cyclical issues of consumption and spectacle. It can be seen as the crescendo of the exhibition. Here, destruction assumes the more aggressive and dramatic character one might normally associate with it. 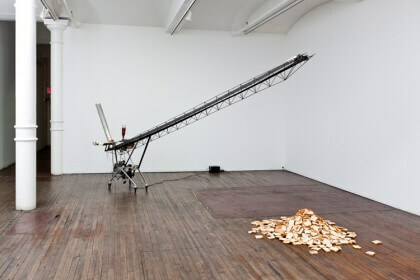 Among the works that more directly engage the question of consumption can be found Johannes Vogl’s absurd, homemade contraption Untitled (Machine To Produce Jam Breads, 2007) which produces pieces of bread with jam on them and thus addresses questions of overproduction and consequently waste. Ariel Orozco’s Doble Desgaste (2005) takes a more metaphysical approach toward consumption, speaking to the vain and deliberate dissipation of effort. In this photographic documentation of an “action”, Orozco systematically draws a portrait of a cube shaped eraser in graphite, photographs the portrait, erases it with the same eraser, redraws the eraser on the same piece of paper, photographs it, erases it, and so on until the eraser and the portrait are gone. Michael Landy’s uneasy relationship with the artificial, accumulative identity of consumption is addressed in the video documentation of his celebrated work Breakdown (2001), in which the artist had all 7,227 of his possessions, classified, dismantled, and destroyed in a department store in central London. The consequences of consumption also unavoidably filter into the issues of environment and technology. Arcangelo Sassolino’s Untitled (2007) perceives technology as a brute, destructive force, which cannot be disassociated from environmental issues. 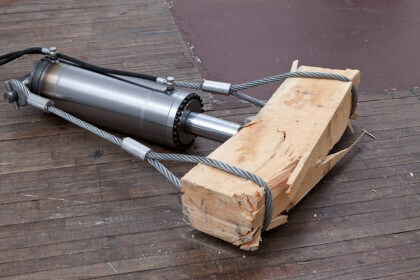 A hydraulic arm that gradually pushes into and senselessly destroys a large block of wood, Untitled consumes with a methodical and massive appetite. Liz Larner’s Corner Basher (1988) could be said, at least in part, to consume the architecture in which it finds itself. This piece consists of a drive shaft mechanism that swings a ball and chain into the nearby corner wall. The activation and speed of the machine is controlled by the viewer. The circularity of this work is carried to another (il)logical extreme in Martin Kersel’s video Pink Constellation (2001). 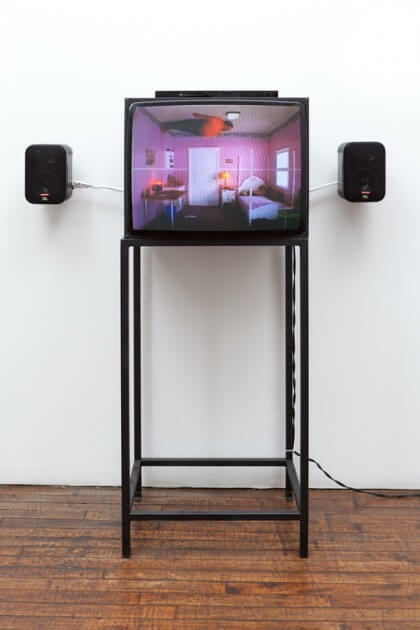 This video features the artist and alternatively a dancer negotiating the topples and turns of a room, which has been outfitted with the accoutrements of a teenage girl, as it rotates end over end, thus transfiguring the somersaulting contents into unrecognizable dreck. 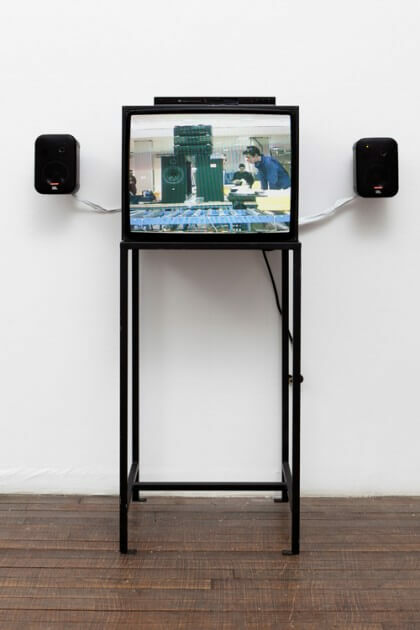 The slapstick humor of this piece finds a rather dry counterpart in Jimmie Durham’s classic sculpture St. Frigo (1996) and its corresponding video installation, Stoning the Refrigerator (1996). The result of beginning his daily routine for ten days in a row by throwing cobblestones at a refrigerator for one hour, this piece speaks to an iconoclastic form of destruction as a daily, self-affirmative ritual. This demolishing element of comedy becomes rather dramatic in the final two works in this part of the exhibition. Where Christian Marclay’s video installation Guitar Drag (2000), which consists of imagery and a thunderous soundtrack of a guitar being dragged behind a pickup truck, is rich in harrowing association, Roman Signer’s video Stuhl (Chair, 2002) is rife with a bracing pathos. The video depicts a chair, which has been attached to the rotating mechanism of a water mill being dragged to its inexorable end, as if in a parody of some medieval form of capital punishment. Curated by Gianni Jetzer and Chris Sharp. A co-operation with Tinguely Museum Basel. 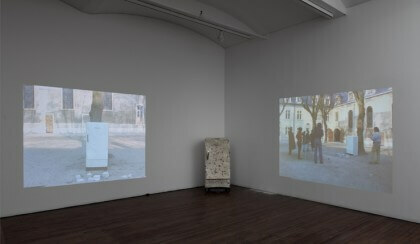 Johannes Vogl, Untitled (Machine To Produce Jam Breads), 2007 Courtesy Galerie Martin Janda, Wien.